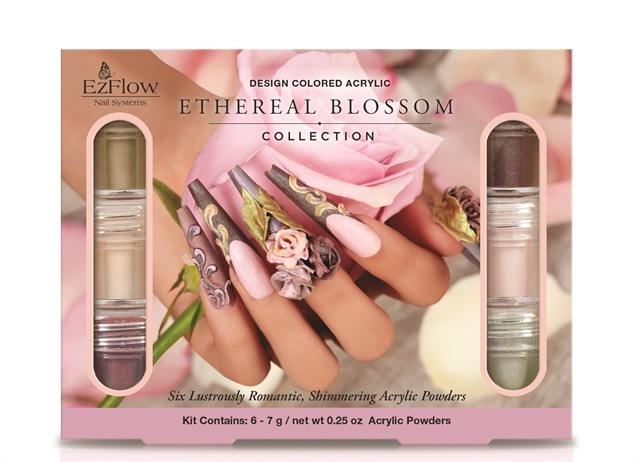 EzFlow’s Ethereal Blossom Design Colored Acrylic collection features subtle shimmers of pink, gold, green, and aqua iridescence, each shade formulated with a shade-shifting effect. Great for 3-D art, the collection is formulated to work with any traditional monomer and to deliver non-fading, consistent color every time. Colors include Pearlescent Petal, a shimmering ivory with gilded gold iridescence; Radiant Rosette, a pastel pink with iridescent rose gold; Luminous Lilac, a lavender purple with blue iridescent hues; Beaming Bouquet, an olive green with a bronze iridescent accent; Budding Beauty, a shimmering plum with a pink iridescent effect; and Rustic Rouge, a brown with an aqua iridescent effect. For more information, visit www.ezflow.com. See more Ethereal Blossom designs at www.nailsmag.com/ntgaezflowers.